Victoria B.C. 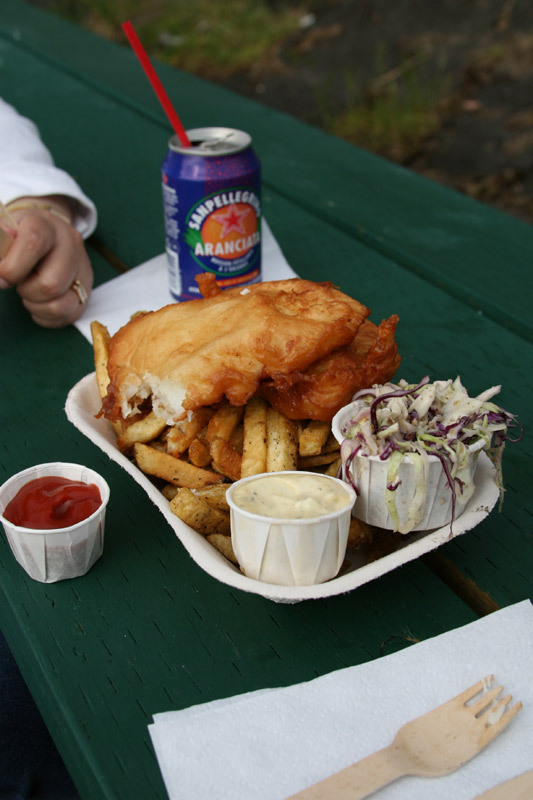 Canada is ground zero for Fish and Chip shops. Fish and Chip shops that serve Halibut or Salmon or Cod. We can dismiss pretty much any place in England because the fish they serve is awful . Ocean Wise is a Vancouver Aquarium conservation program, created to help restaurants and their customers make environmentally friendly seafood choices. The Ocean Wise label on a menu item assures you that item is a good choice for our oceans. British Columbia is known for its fresh, high quality seafood and Red fish Blue Fish is proud to be 100% Ocean Wise when it comes to the seafood they serve. Maybe now I will just settle on Ocean savvy. Yea. I think that will do. Check the menu. And then look at the competition over at Barb`s Place Yea. 24$ for 2 Pieces of Halibut and a drink at Barb’s – $17.50 at Red Fish Blue Fish. Agreed! Red Fish Blue Fish is fantastic. The portions are generous and I love that they are promoting sustainability from the fish they purchase to their shipping container kiosk.